My name is Stefani and I come from Bulgaria. I have been involved with Project Firefly for a while now and have participated in several of their competitions, as I have a passion for finance. Recently, I also became a PF ambassador, as I firmly believe in PF's mission and its ability to help students from non-target schools stand out by showcasing their abilities. 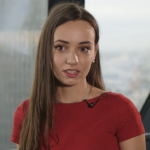 I am currently working as a securities broker at Adamant Capital Partners in Sofia, while studying economics and business at the American University in Bulgaria. Previously, I completed internships at the SAP headquarters in Germany, Telenor Bulgaria, and Kreston BulMar. I am currently an ambassador for Project Firefly and a member of the Assets Trading and Management Club at the American University in Bulgaria. I have worked as a writing, calculus, and introductory mathematics tutor at AUBG. Tutoring has been one of the most educational activities in which I have engaged. Not only has it improved my own writing and math skills, but it has also improved my patience and ability to express myself in a clear and understandable way. In addition, I have become more tactful, attentive, and able to relate to people from different backgrounds, as the student body at AUBG is very diverse. Furthermore, by tutoring unfamiliar subjects in the writing center, I have learned to apply what I know about writing to a foreign discipline and relate my skills to areas I am not familiar with, which is an academic skill that is indispensable for me. In addition, I work on my foreign language skills whenever I have a chance and I am also engaged in acting and other performing arts and photography.